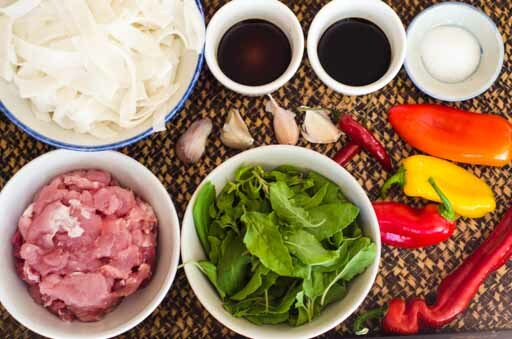 When I was still living in Thailand, Pad Kee Mao was a very hot stir fry with meat, holy basil and seasoning. 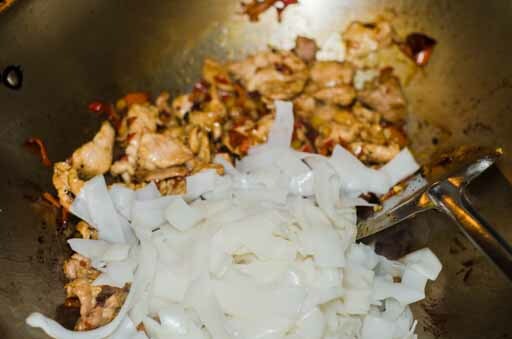 When oyster sauce became popular; it was incorporated into Pad Kee Mao. Spaghetti Kee Mao was popularized. Seafood Kee Mao was added. 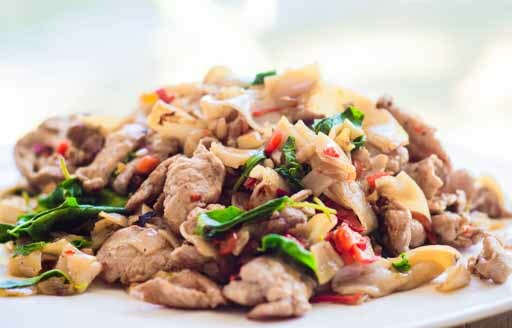 Recently, Pad Kee Mao has gotten so drunk that it can’t even remember its repertoire. More vegetables and herbs slowly show up on Pad Kee Mao’s ingredient list; mushrooms, onions, baby corn, bell peppers, carrots, green beans, kaffir leaves, Chinese keys and fresh green peppercorns, Thai basil and even eggs. All in all, the common thread is still the intense heat. The tongue of a drunk can’t feel the spicy hot chili peppers; the vibrancy of the flavors and seasoning must make up for it. As most of us will be cooking and eating Drunken Noodles sober, I tone down the heat but keep all other flavors true to the dish. When you feel like having the noodles with an insanely amount of alcohol, crank up the seasoning and the chili peppers as you please. Enjoy! In Thailand, we use a type of chilis called Prig Chee Fah for this recipe but a combination of sweet peppers and hot peppers will give the right flavors without too much heat. 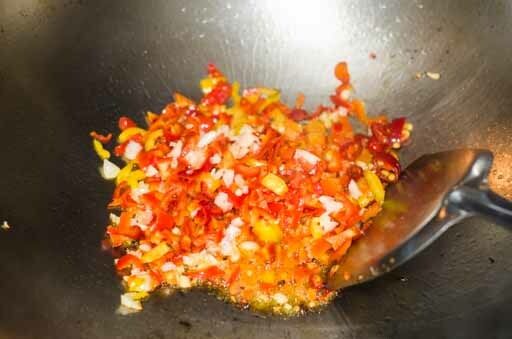 When you use only Thai chili peppers, you can pound garlic and chili peppers together in a mortar and pestle as other larger peppers are more difficult to pound. Chopping the peppers seems to make sense. I add many sweet peppers to tone down the heat for people who enjoy a small amount of chili peppers. You can use whatever amount of chili peppers in order to hit the spot. 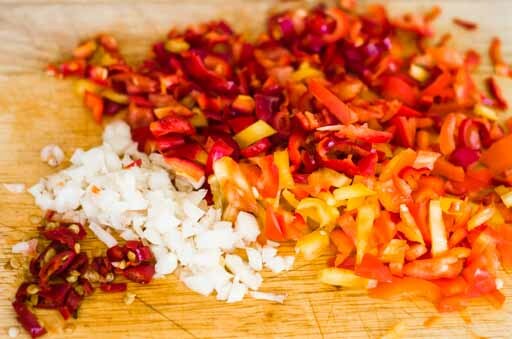 Chop garlic and chili peppers. You can use any combination of peppers for their heat and colors. With this recipe, I use one Thai hot chili for the heat. The rest are sweet peppers. Pick the holy basil from stems. Thinly slice the pork. If your fresh rice noodles are stored in the fridge, let them warm up or come to room temperature. Remove the noodles from the foam tray and microwave them in a microwave-safe plate. You may need a couple of minutes. When they are soft and pliable, separate them into strands. Add cooking oil to a wok or pan, using high heat. 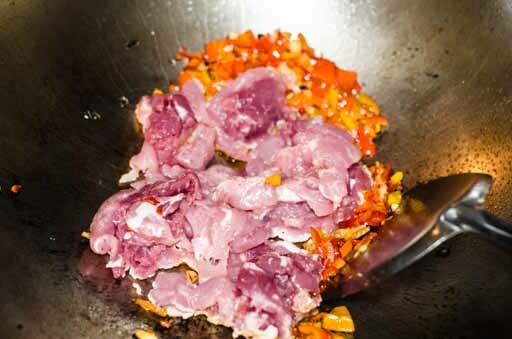 When the mixture of hot chili and garlic hits the hot oil, it will create an eye and nose irritating fume. Make sure your kitchen is well ventilated. With just one hot pepper, everyone in the vicinity was coughing and sneezing. Add the mixture of garlic and chili peppers in. Let it cook briefly, then add the pork. 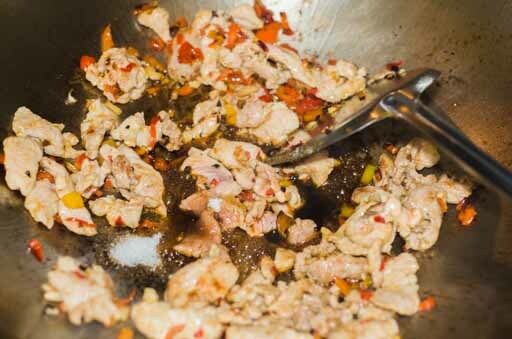 Stir until the pork starts to turn brown. You should see juice pooling. Add soy sauce, fish sauce and sugar. When the pork is cooked, taste to see if you like the seasoning. It should taste saltier than you want; we’ll add the noodles which will absorb all the seasonings. If you decide to make noodles very hot, you may need more fish sauce, soy sauce and sugar. When the pork is ready, add the noodles. Stir to mix the noodles in with the pork. If you want to taste the noodles again, this is a good time. Add holy basil and stir until the holy basil is incorporated into the noodles. Turn off the heat and serve hot.